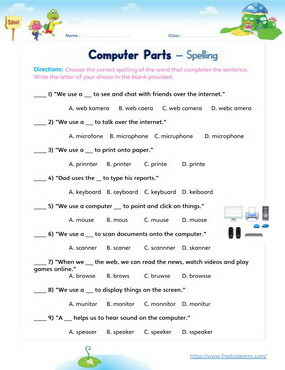 Teach English learners the names of computer accessories and how to talk about their different functions. 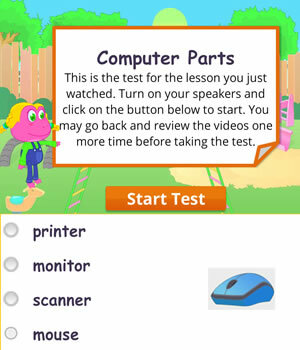 This English lesson is also meant to introduce EFL/ESL young learners to a number of action verbs that are specific to the computer environment. The worksheets below are useful for offline and classroom activities. 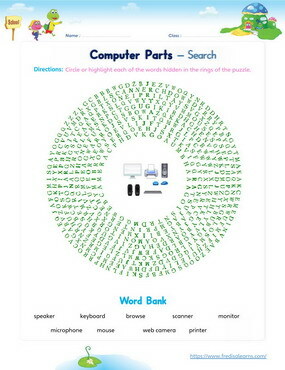 These printable exercises directly correlate with the above lesson 'Computer Parts'. Every worksheet comes with an answer sheet on the second page for educators. Dad is in his study and working on the computer when Lisa comes in. She is keen to learn the names of different computer accessories. As Dad talks her through the different computer accessories, the sound of the printer scares her off. During the conversation, a call comes in from Dad’s boss through the web camera and Lisa gets to chat online. We use a keyboard to type a report. We use a mouse to browse the web. We use a mouse to point and click on things. We use a printer to print onto paper. 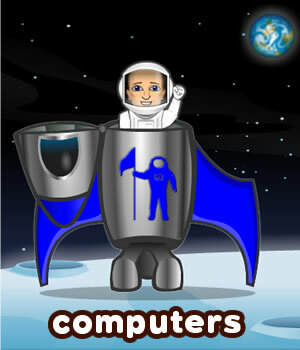 We use web camera to chat with friends. We use a monitor to display things on the screen. We use a scanner to scan things onto the computer. We use a speaker to hear things on the computer. Lisa: Hi Dad. What are you doing? Dad: I am working on my computer. Lisa: What are you working on? Dad: I am typing a report. Lisa: What are you typing on? Dad: I am using a keyboard to type. Lisa: How do you do that? Dad: I press down on the keys. The words come up on the monitor. Lisa: That is very cool, Dad. Is the monitor the screen? Dad: Yes, the monitor displays my work for me. Lisa: Oh, so it helps you see what you’re doing. Dad: Yes. If I see a mistake, I can go back and fix it. Lisa: How do you get back to the spot you need to fix? Dad: I use the mouse. Lisa: What does the mouse do? Dad: The mouse helps me to point and click on the part of the report I want. Then, the display shows me where I am. Lisa: Dad, what was that noise? Dad: Lisa that was the printer. Lisa: What does the printer do? Dad: It takes what is on the monitor and prints it onto paper so I can take it with me. Dad: It’s very important. Now I can take my report to my boss. Dad: My boss is calling me. Let’s turn on the web cam and the speakers. Lisa: Wow! Dad! Look! It’s your boss. Dad: Yes, Lisa. I used the web camera to see him. It shows me who is on the other computer. Lisa: Wow, I can hear him too! How can I hear him, Dad? Dad: The speakers help us hear sounds. Lisa: This is so cool, Dad. I love computers! This lesson is part of the Level 4 English course.